Never one to put all their eggs in one basket, Onyx has quietly shipped an OEM version of the AfterGlow 2, that mid-priced ereader launched earlier this month in partnership with Arta Tech. The Onyx Boox C67ML is in many ways identical to the AfterGlow 2, only it costs less and comes with less bloatware. My competitor found this ereader a few days ago on Banggood.com, a Chinese retailer. The C67ML runs Android 4.2 on a dual-core 1GHz CPU with 512MB RAM and 4GB internal storage. It has a 6" Pearl HD E-ink screen with frontlight and touchscreen, and it also has Wifi, audio, and a microSD card slot - just like the AfterGlow 2. Just about the only way the specs for the C67ML differ from the AfterGlow 2 is that the latter lists a slightly faster CPU, comes with several apps which I would not want anyway, and explicitly mentions that it ships with Google Play. The AfterGlow 2 is listed as being about 40 grams lighter, and it comes with TTS software from Ivona. Both devices run the same stock reading app on the same version of Android, and they come with a similar suite of apps. All in all, the two devices are similar enough that I would bet they are the same device, just with slightly different software. Oh, and one costs $40 less and comes with a case. Needless to say, I think the model sold by Banggood.com is a good value. If I weren't already overloaded with review units, I would get one and play around with it. 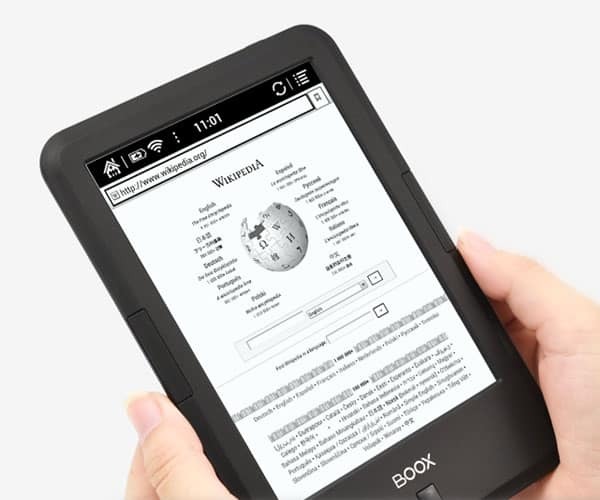 The Boox C67ML is the third Onyx ereader to launch in the past month, and the second to launch and ship from China. For a market which I thought was on a downward turn, that is a rather fast launch rate. I just ordered a Paperwhite 2 ! I’d really like an android reader (mostly to use Pocket ), but I’m still worried about the battery. According to Bangoo T62’s battery is 3000mah, c67ml is 1700..
That could explain the difference in weight. Good catch. Btw. No Google Play, no Ivona Text-to-speech. It’s cheaper for me. And since my T68 Lynx doesn’t have Ivona either, I don’t see how the lack of it matters here. Onyx BOOX Lynx features IVONA TTS. Did you remove voices? It gets deleted when the firmware is reset. I was exchanging emails with you at the time so I’m pretty sure Arta tech knew about it. How would the use of battery in this model? I think, battery life is a weak side of the Boox 67. It´s last no more than 20 hours reading. and need 5 hours to recharge.